It seems like you cannot go a day without hearing about all the benefits of green tea and while most of the benefits usually touted relate to weight loss, there is also an important connection between green tea and fibroids that you should not ignore. Tea is the most popular beverage after water. White tea is dried immediately after picking to ensure that it is not wilted or oxidized. 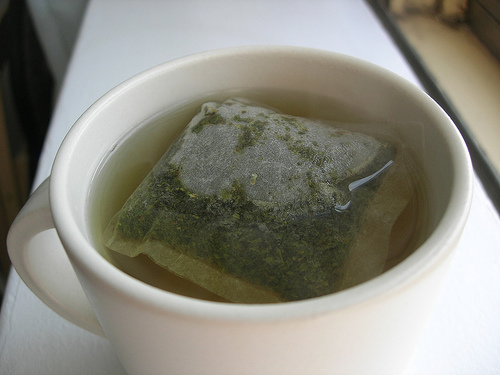 Green tea like white tea is the freshest and least processed as it is wilted but not oxidized. It like white tea has a light and subtle taste and is the most popular with tea drinkers in Asia and North Africa although it is certainly increasing in popularity in the West. Oolong tea is a compromise between green and white tea and is wilted but only partially oxidized. Black tea has a strong and hearty taste which comes from its being both wilted and completely oxidized. While all these teas contain caffeine, black tea contains the strongest amount of caffeine and white and green tea the least amount of caffeine. This is because as the tea leaves dry, wilt and oxidize, they lose water allowing the caffeine to become more concentrated. It is this caffeine that is thought to help with weight loss. One of the most powerful antioxidants in tea is known as EGCG (epigallocatechin gallate). The process of oxidation destroys much of these oxidants which means that white and green tea contain the highest concentration of EGCG while oolong and black tea contain the least. The connection between green tea and fibroids is tied to this antioxidant. Various studies were conducted that administered green tea extracts to women with fibroids and a placebo administered to other women with fibroids. The results of these studies showed that those who were given green tea extracts that contained EGCG, reported a reduction in the size of the fibroid tumor while those in the group that received the placebo reported an increase in the size of fibroids. Those in the former group also reported a reduction in various symptoms of uterine fibroids such as heavy bleeding. There are two components of the connection between green tea and fibroids that researchers noted. First of all, the EGCG stopped the spread of the fibroid tumor cells (this is also probably why tea is able to prevent certain cancers). EGCG is also able to cause the tumor cells to die off leading to shrinkage of the fibroid tumors. With all this great news about green tea, why wouldn’t you incorporate it into your daily life? Much of the research on the health benefits of green tea which has been found of the various teas to have the most beneficial health effects, required participants to drink at least five cups of tea a day. But do keep in mind that large amounts of tea can also cause gastrointestinal upset. While green and white teas contain the least amounts of caffeine, they still contain some caffeine so this is something to consider when you drink several cups of tea a day. Also caffeine has been linked to an increased risk of birth defects which is something for pregnant women to consider. Caffeine can also cause nervousness, insomnia, restlessness, etc. You can also get decaffeinated tea which doesn’t affect its antioxidant content. Do not add milk to your tea as it has been found to block the absorption of the antioxidants in tea including EGCG. The disease fighting properties of tea can be unstable in non-acidic environments so adding a little lemon to the tea may help with the body’s absorption of these nutrients. If you eat fried foods or broiled meat, you may want to drink a cup of tea after since it can help block the cancer causing chemicals that may be present in these foods. There are many theories about how to make the perfect cup of tea so pick what works for you. Some people advise against using boiling water, or using loose leaves and not tea bags for the best tasting tea, etc. However while tea connoisseurs prefer loose tea, it has been found that the pulverized contents of tea bags actually help release more antioxidants than larger loose tea leaves. It is generally recommended to steep the tea for about 2 to 3 minutes and some studies have found that tea releases its antioxidants almost immediately so steeping for longer minutes will not lead to more antioxidants being released into your tea. For the best source for various types of organic teas including green tea, click here. The connection between green tea and fibroids is so important and exciting and unless you are pregnant, you should start drinking or drinking more green tea in order to enjoy its health benefits that are so much more than just natural fibroid treatment. For a complete step by step guide that includes various natural remedies that will help you eliminate fibroids for good, click here for a 3-step system that you need if you want to be done with fibroids.